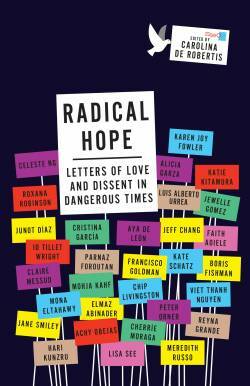 From the book "Radical Hope: Letters of Love and Dissent in Dangerous Times," edited by Carolina De Robertis. Compilation copyright © 2017 by Carolina De Robertis. Just published by Vintage, an imprint of The Knopf Doubleday Publishing Group, a division of Penguin Random House LLC. When you were seven weeks old, we took you to a wedding in New York City. We dressed you in an embroidered white linen dress I’d also worn as an infant, we combed what little hair you had, we popped you in the car seat and zoomed down from western Massachusetts. With the exception of the lovely bride, you were the belle of the ball — handed from aspiring grandmother to aspiring grandmother, chin-chucked, dandled, cooed over, cuddled. Daddy surreptitiously changed your diaper in the library of the fancy private club. A television star praised your dimples. You loved every minute and didn’t cry once. Two days later, less than twenty-four hours after we got home, al-Qaeda terrorists hijacked passenger jets and flew them into a field in rural Pennsylvania, the Pentagon, and the Twin Towers, killing thousands. The world into which we thought you had been born was ineradicably altered in a matter of hours. So began the terrible Time of Fear, the better part of a decade in which our actions and reactions as a nation were premised on constant dread and anxiety. We prosecuted wars on false pretenses; we blithely dispensed with our fundamental moral beliefs and turned a blind eye to extraordinary rendition and torture. With arrogant ignorance, inadequate military preparations, and botched strategies, we sacrificed countless young men and women, both on the battlefield and afterward, many of them victims of severe injuries whose lives can never be fully restored. We treated our allies in the region with cavalier indifference (remember Kirk Johnson, Daddy’s friend from Berlin, who started the List Project and worked so hard to help Iraqis abandoned by the American government for whom they’d worked?). In the course of these years, we alienated a generation of young people across the Middle East. When I visited Turkey in 2007 as a cultural guest of the State Department, it was explained to me that under Bill Clinton, the United States had had a more than 75 percent approval rating in Turkey. By the last years of George W. Bush’s presidency, that rating was 9 percent. And 50 percent of the Turkish population was under twenty-five years old, which meant that most young Turks had never thought well of our country. In 2008, Barack Obama ran for president with the slogan “Yes We Can,” on a platform of “Hope.” You turned seven years old that year — the age of reason — and both at home and in the country, the optimism was palpable. Your friend Annie favored Hillary and dressed up as HRC for Halloween; you liked them both, Hillary and Obama, and didn’t mind who won. Even though you were still small, you laughed at Sarah Palin jokes — not realizing, I think, that they were funny only because she wasn’t elected. We believed that we could, as a nation, surmount our fear together. We believed in choosing peaceful dialogue instead of conflict; in openness and tolerance instead of division and hatred. We believed in a progressive future instead of a return to the past. These past eight years have not been without problems or limitations. But it has a been a gift for you — and for us, raising you — to grow to maturity in a political culture that supports equal rights, dignity, and mutual respect for all, that believes in global cooperation on important issues as diverse as climate change and world peace. Now, my daughter, you’re approaching sixteen. This year, you were passionate about the election: first about Bernie Sanders, then about Hillary Clinton. Passionate, too, about the unfortunate alternative, the man who will now be our president: passionate about the many ways in which his vision for America is diametrically opposed to yours, passionate about how dire will be the consequences of his policies — for the truth, for facts, for the rule of law, for dignity, for women, for minorities, for the environment, for workers, for world peace. Here we go again, back into a permanent defensive crouch, a return to the Time of Fear we knew when you were a little girl. It’s not that we can’t get through this — of course we can. As Katharine Viner, the editor of the Guardian newspaper, wrote to subscribers on November 9, the day after the election, “Progressive ideas are good ideas and the Guardian will never turn away from them.” Nor should any of us. I know you won’t. But I’m sorry that you’re launched so young into the fight: I would have wished for a few more years of relatively straightforward optimism. I know you’re at the ready, too. I know you and your peers have the faith, the patience, and the fortitude that will be demanded of you. Remember that this man is not the cause of our society’s problems; he is merely the symptom. If we battle those ills, we can defeat him. He is the face of many of our failings, his rise the confluence of diverse problems to which we have failed, as a nation, to attend. With the disappearance of any counterbalancing Marxist — or even socialist — discourse, Americans have become utterly enslaved to mammon. (Bernie Sanders and his followers represent the national outrage at this situation.) Like some parody from central casting, the demagogue in chief believes his wealth alone entitles him to the highest office in the land; and apparently, many voters, too, have lost sight of the fact that statesmanship is not the same as business acumen. Our national moral compass is wildly askew: as long ago as 2009, in the wake of the financial crash, I listened to a commentator on NPR explain that the rights of the individual had been enshrined in the Constitution precisely because they had been previously considered supernumerary. It never occurred to the Founding Fathers that the rights of the individual could threaten the common good; and yet, the commentator lamented, by 2009, this was the pass to which our society had come. In the 1980s, 1,100 people were prosecuted after the savings and loan crisis; in the wake of the 2008 financial crisis, only one top banker went to jail. This was the result of a shift in mores over those twenty years: Americans, obsessed with personal gain, no longer see the common good as the highest good. Indeed, the unnameable-elect, in debate, could argue that his failure to pay taxes — an abdication of which millionaires of yore would rightly have been ashamed — was simply a matter of his intelligent use of a legal loophole. In other words, his scrupulous attention to his private wealth was a matter for public admiration rather than condemnation. And he was elected for it. Then, too, there’s our social media problem, and its concomitant — though preexisting — celebrity problem. We’ve talked a lot, latterly, about fake news, and that’s certainly an issue. But the Gordian knot has many strands. We’re ever more powerfully grafted to our devices and are hence always immersed in the general cacophony of contemporary existence, inundated by noise and information so that it becomes impossible to tell vital details from fripperies, seriousness from nonsense. We used to know that the National Enquirer was not the New York Times; with the advent of the Daily Mail online, the distinctions are no longer so clear. Another strand is our willful infantilization as a culture: we seek constant distraction, amusement, and simplification; and purveyors of information (and so-called news) are only too happy to oblige. Syntactically, analytically, conceptually — we grow ever lazier, and alas, before long the 140-character tweet will come to represent the length of our attention spans. You and your peers will have to take responsibility for this world of idiocy that my generation has foisted upon you, and will have to demand, of yourselves, a greater commitment to and engagement with complex realities. Some truths are irreducible. Important matters require effort and patience, and can often be boring as well as arduous. Life is no bowl of cherries; nor is it a Doodle Fruit Game. Then, too, there is our society’s disingenuous myth-making, the lies we tell ourselves to dull rebellion. The American dream, as Ta-Nehisi Coates has recently observed, remains for many (particularly minorities) a false promise. You remember the obese, unwell, and aging taxi driver who routinely took us to the airport before dawn, obsessively ranting against Obamacare, because when he makes his millions he doesn’t want to have to pay for anyone else’s medical bills? He’s one of many deluded by a fantasy, a fantasy that Donald Trump has rekindled and encouraged: the idea that each of us is a millionaire in waiting, who should behave with all the superiority and scorn of a millionaire, in the firm belief that the individual matters more than society, and in the firm belief that money matters more than background (which it may) or than education (which it may not) or than morals (which it cannot), and that money will soon be ours. Remember our amazing evening at "King Lear?" Can you see, in your memory, Lear mad upon the heath, besmirched in his tattered loincloth, his crown of weeds, his kingdom and his power lost? We joked afterward that the new president should be made to sit through it, and you laughingly said he wouldn’t, he couldn’t. Because the play’s lessons — its wise truths — were too uncomfortable for such a man to endure. “Handy-dandy, which is the justice, which is the thief? . . . A dog’s obeyed in office. . . . Robes and furred gowns hide all. Plate sin with gold / And the strong lance of justice hurtless breaks.” Only when he wanders naked and abandoned in the storm does Lear realize, at last, that all men are the same; that the greatest and least among us are kin. That there but for the grace of God, and so forth. It’s a lesson all of us must learn, sooner or later. For many, it isn’t until we’re near death. You were too young to remember it, but I truly understood it first when Grandpa was in the rehab hospital, the first time he was dying, not in his right mind (though mercifully his wits eventually came back), around the time he waved a twirling finger in the air—not unlike Lear, in fact—and said, “I know what this is—it’s a fiesta!” And a nurse’s aide came in, her shoes squeaking on the linoleum, clipboard in hand, and asked, in efficient tones, without looking at the man in the bed, “What was he, before?” Suddenly I grasped, truly, that my father, whom I so loved and had so feared, had held in awe, was, too, no more than a poor, bare, forked animal—unaccommodated man—the same as anyone else. I would learn it again and again, in the course of my parents’ illnesses, their respective journeys to the grave. All that we believe defines us counts for nothing. Ultimately, each of us is not just Lear in his (lucid) madness, we’re Poor Tom himself. To live in hope, without fear, with nothing to lose: that’s freedom. And that’s what democracy should allow. Any society that believes that money is the greatest power can’t truly be free. The wise have always known it — from Jesus Christ to Julian of Norwich (the medieval mystic whose adage is my mantra: “All shall be well, and all shall be well, and all manner of thing shall be well”) to Shakespeare to Gandhi, Mandela, and perhaps even Obama. This callow soul our nation has recently elected to its highest office is far from attaining this fundamental knowledge; as, one must presume, are too many of our fellow citizens. You were born into strife, or all but. You’re so young, still, and as I say, I’d wish for you that the struggles presented by this presidency and its follies didn’t loom so clearly and alarmingly before you. But alas, dear one, we can’t ignore the call: our futures — not just ours personally but those of the nation and the world we love — depend upon it. As Poor Tom knew, as Lear came to know, we’re all bare human beings beneath our clothes, humble in our lives and deaths. Power and prominence are as meaningless as wealth and beauty. All is vanity. This hollow president — vanity incarnate — is the voice of a hollow culture: hollow men (and women, Kellyanne Conway!) are abroad in the land. So, Livia, my dearest daughter, it’s up to us — and in the future, it will be up to you — to defend substance, to forge a true path, and a meaningful one. To be fearless, joyful, hopeful. Privileged as we are, we have an obligation to be happy, to work for justice, openness, and generosity whenever possible; to listen fully to complexities and to try our best to understand; to hold the lamp illumined and aloft. No good gesture is wasted. No kindness is otiose. No sacrifice is too great. Each of us must shed light wherever we can. Courage, my love. I have great faith in you, and in your generation. I’m always at your side, holding your hand. We’re stronger together. Claire Messud’s “The Emperor’s Children” was a New York Times, Los Angeles Times and Washington Post Best Book of the Year. Her first novel, “When the World Was Steady,” and her book of novellas, “The Hunters,” were both finalists for the PEN/Faulkner Award; and her second novel, “The Last Life,” was a Publishers Weekly Best Book of the Year and Editor’s Choice at The Village Voice. All four books were named New York Times Notable Books of the Year. Her newest novel, “The Burning Girl,” is forthcoming from W.W. Norton on August 29, 2017.